The Afthead Christmas season begins with a trip to Main Street of my hometown. 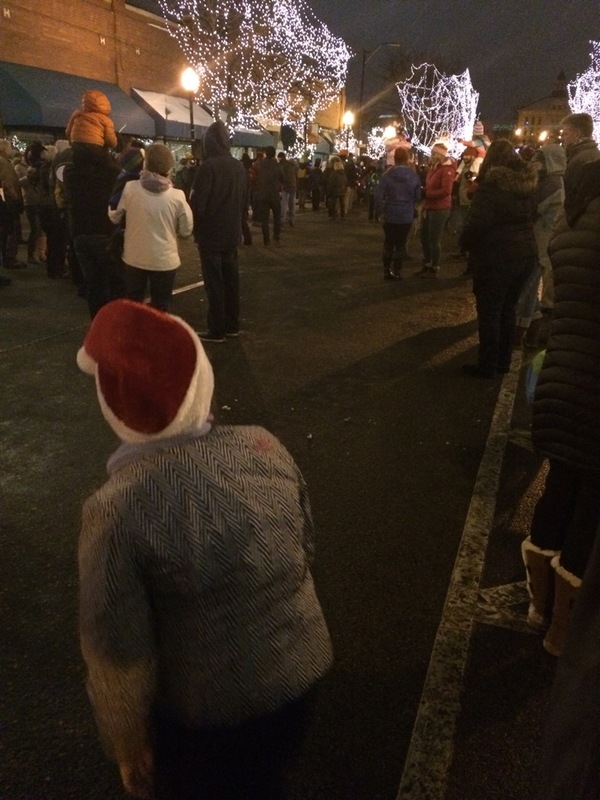 The four blocks are lined with trees covered in tiny white lights, dark until Santa arrives. He travels in the back of a truck waving to the kids, and when he reaches the beginning of a new block the lights magically illuminate. This year it was cold and snow flurries painted the sky. My daughter and her friend were bundled three layers deep topped with Santa hats. Both of them believe completely in Santa, and while they know this is not the real guy, eight years of a tradition have made him special. The girls call in unison as Santa passes. Because they are bigger and the crowds stayed home to avoid the cold this year I ask, “Do you want to go down another block?” They do. This year we see Santa four times and he sees us twice, by the girls’ counting. Only at the last block do I have to threaten, “Girls,are you really hitting each other? He is right there!” Their cold bodies extend for one final wave. It’s great! Downtown Littleton and always the day after Thanksgiving. You and your family should check it out if you are ever in the area. I have never thought to go over there. I will have to check it out! It’s really magical. I love the shopping on the street too. I avoid the big malls by spending my holiday dollars at those small businesses. Happy to call Littleton my Home too! I look forward to reading what else you write! Hi Catlin! Thanks so much for the nomination. It’s always cool to find geographically close blogger. I grew up in Littleton and now live all the way in Denver, but my parents are still there. Nice to meet you! I agree! What a surprise to find someone from Littleton. Nice to meet you! The link I’m getting on your comment goes to a blog without any content: https://educationmusings.wordpress.com/. Do you have another place I can follow you?